You’re trying to grow your own business or please your boss, and you want fast results. You read that email marketing’s performance has no equivalent. But to send emails, you need a recipients list. And you don’t have the time to build one. Fortunately, you find a shortcut: websites offering to sell email lists. In this article, we’ll tell you why it’s not and how you can build your own list effortlessly. What Exactly Does Buying an Email List Mean? Of course, everyone knows what buying an email address list means. But things are not as simple as they look. 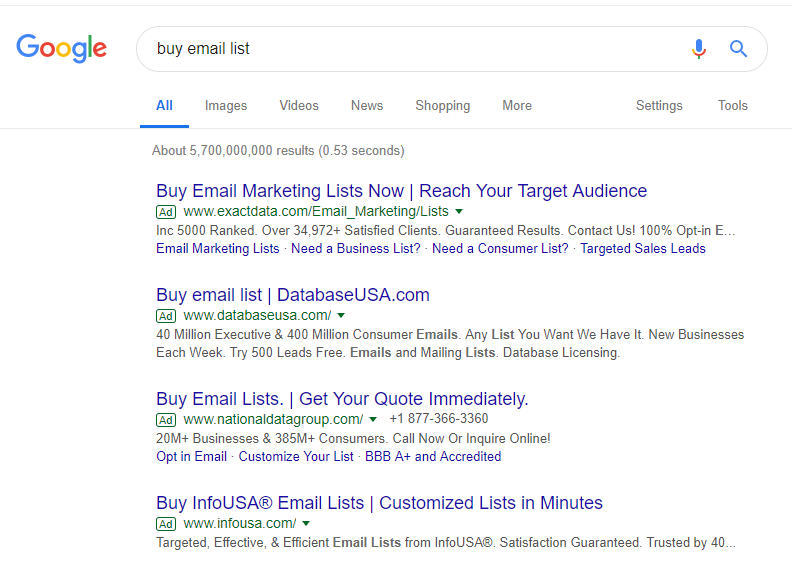 There’s an important distinction to draw between the email marketing lists that you can rent and the lists that you can buy. When you buy an email list, you get a file containing a list of contacts that you email yourself. When you rent a list, you send your email to someone else’s list. The list owner will send the email for you, and you’ll never get to see who received your email. It’s as if you paid for an ad in someone’s newsletter. Scrape emails online (in this case, the company providing the list is scanning the web to find public email addresses). Use surveys or phone calls to collect the contact details directly. Use sweepstakes and other enticements. That’s probably why legislators chose to define rules for this kind of activity. Is It Legal to Buy or Rent an Email List? Buying email lists seems simple. A quick Google search returns a lot of promising results…But this doesn’t mean it’s legal. Let’s review what the law says in North America and Europe. To understand what is acceptable in the North American zone, I spoke with Travis, a lawyer working in the compliance department of a prominent American bank (and yes, he wanted to remain anonymous). Here’s what he told me about what’s legal in the US. The rules that apply to commercial emails were defined in 2003 in the CAN-SPAM act. The law makes it possible to buy or rent email lists, as it doesn’t require you to get the recipients’ consent before contacting them. One of the main risks, if you’re buying or renting an email list, is contacting people who’ve previously asked to be removed from your list. To avoid that pitfall, make sure to exclude all the people who have opted out from your communications. Canada maintains one of the strictest positions when it comes to email lists. The CASL (Canada Anti Spam Law) set precise rules for commercial messages. The first one is that citizens must provide their consent before you can email them. In short, you can only contact people who have given their explicit consent to be contacted, or, in some cases, people with whom you have an existing business relationship. Of course, if you’re buying an email list, you’re not complying with these requirements. So buying email lists that include Canadian residents would be illegal. Renting an email list, on the other hand, can be OK if the provider collected consent in an appropriate way. To understand what’s allowed with European citizens, I interviewed Emilie de Vaucresson from EDV Avocats, a prominent IP/IT law firm based in Paris. The first one is called the ePrivacy directive. According to this text, the use of an individual’s email for direct marketing purposes is lawful only if that individual gave his/her prior consent. The second is the GDPR. This text explains that for the consent to be valid, it needs to be freely given, specific, informed and unambiguous. One stipulation for a consent to be valid makes it particularly difficult for bought email address databases to be lawfully used for direct marketing purposes: the requirement concerning prior information. In order for an email database to be activated by an email marketer who has purchased it, the individuals who consented to receive marketing emails must have been informed – at the time their consent was given! – that this particular email marketer would send them direct marketing emails. In practice, this isn’t likely to happen: email list sellers generally focus on obtaining an individual’s consent to receive direct marketing emails, and then worry about being able to sell the list. To compile a legal list that can be lawfully activated by the customer purchasing the list, the email list seller would have to know who he was selling it to before compiling the list. This severely limits the seller’s agility in compiling lists to sell, as it limits each list to one specific purchaser!. However, EU law is not as hard on the process of renting email databases as it is on buying them. When a company rents a list of email addresses, it never actually has access to the addresses to which its emails are sent. The list owner does all the direct marketing operations in his own name and is, as such, the only one who has to comply with ePrivacy and GDPR obligations. The list owner still has to obtain individuals’ prior consent for the use of their email addresses for the promotion of a third party’s products and services, but it does not have to identify the third party for whom it will send direct marketing emails at the time the consents are collected. All in all, renting an email database is the only legally viable option for marketers in the EU. So far, we have seen that buying email lists is only legal in the United States. Let’s say that you’ll contact recipients in the US. What happens once you’ve bought the list? Well, there’s one last obstacle: the rules set by email service providers. Most ESPs have their own policy regarding email lists. And often, they are stricter than the law. MailChimp’s website, for example, explains that buying opt-in lists is a strong no-no. The same goes for a majority of ESPs, from Klaviyo to Pardot and Aweber. But why do ESPs care so much? We’ll see later in the article. Is It a Good Idea to Purchase Email Marketing Lists? These past few years, the rise of Growth Hacking has blurred the line between what’s legal and what’s not. What are now major companies have based their growth on strategies that most judges would consider as breaking the law– from AirBnB reposting listings on Craigslist automatically to startups massively scraping LinkedIn to find hot leads. So let’s assume you found an ESP that lets you import your purchased list, and you’re contacting US citizens or that you’re renting an email list. Can you expect good results from a 3rd-party email list? Would you ever buy a car if you knew there was a chance it would never work? If not, why would you do the same for your email contacts? To prepare this article, I contacted a few lead generation experts. Their opinion about purchased email lists was unanimous: The results you’ll get with them are usually pretty bad. Let’s start with testimony from Keller, a lead generation professional from Leadsurance. But why this performance issue? Most of these lists are not up-to-date. They often include emails that no longer exist, thus generating a high bounce rate (the rate of recipients that will never receive your email). Most email services will flag your email as spam (among other things because they can use spamtraps to detect that you purchased a list), thus generating a low open rate (the proportion of your recipients that actually open your email). These lists are usually quite broad and include contacts that are not in your target market. Your recipients have probably never heard of your brand. It means that they will be less likely to open and click your email and more likely to ignore it. This one applies to purchased email lists only. Have you ever heard about sender reputation? In short, email services such as Gmail, Yahoo, and Microsoft evaluate your reputation as a sender. If you send emails that their users flag as spam, or if you send a lot of emails, etc., they will identify you as a spammer. Sending emails to people who have not given their consent to receive your emails will most likely harm your sender reputation. It means that, in the long run, the probability of your emails arriving straight in the SPAM folder of your recipients will increase. And what makes this even worse is that fixing a damaged reputation takes a lot of time and effort. I think by now you should be convinced that buying or renting a lead generation database is not your best option. “Then what IS my best option?” you may ask. Well, your only real option is to build your own email list from scratch! Let’s see what the best ways to do this are. The easiest way to start an email list is to collect email addresses on your website. Start by thinking about what might convince someone to join your email list. Will you share exclusive news? Educational content? Will your subscribers get a freebie when they subscribe? Are you holding a sweepstakes? Once you’ve found your lure, give it maximum visibility. Use an email popup. Countless studies have proved the positive impact of email popups. On average, they convert 3.75% of visitors into email subscribers. Add a signup form to your pages. 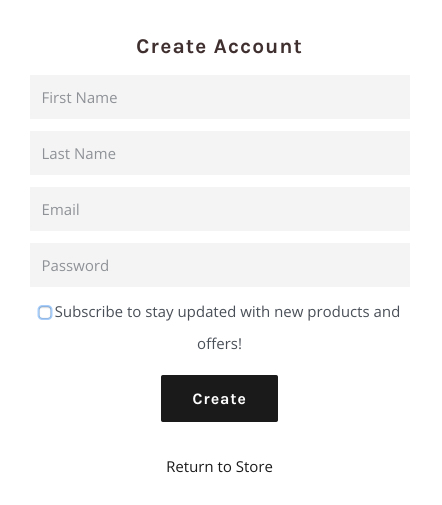 Forms are great complements to calls-to-action and popups. When you’ve found the right position on your website, they can bring a significant flow of contacts. Collect email consent during the checkout or signup process. Ask your customers if they’d like to receive your marketing emails when they purchase something from you. If you’re participating in fairs or have an offline presence, leverage these assets to grow your list. 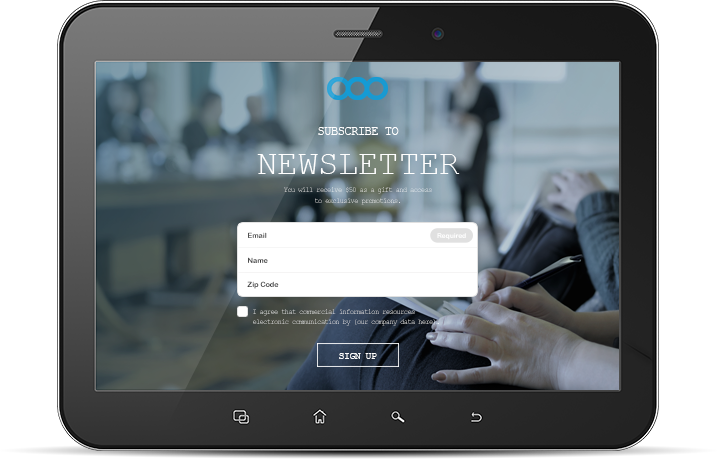 You can use a tablet, for example, to let people enter their email address. 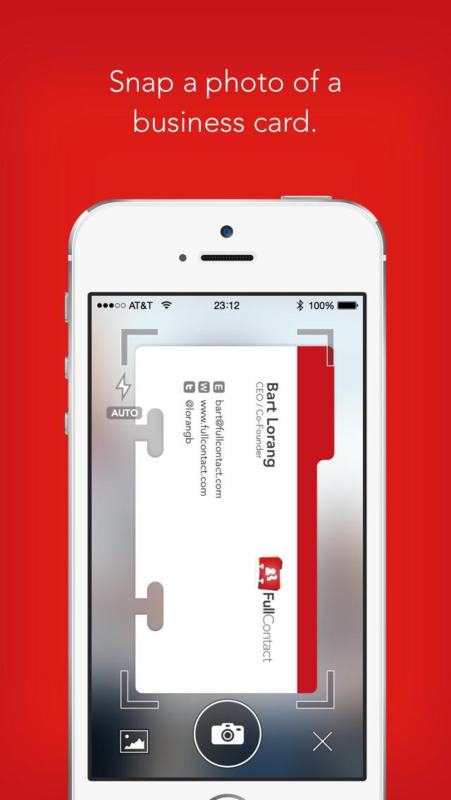 You can also collect business cards and turn them into contacts using a scanner app. In the US, it’s OK to contact people if their email is publicly available on the web and if you use their contact reasonably. In that case, you can build your email list by browsing the websites of your target contacts and looking for their email. You can use Hunter to help you save some time. Once you find their contacts on the website, save a screenshot of the page as proof that you found the email address online. Is it legal to email people without their consent in my target country? Does my ESP let me import 3rd party lists? Am I sure that the list I bought is relevant for my business? Do I have guarantees that the data is up to date? Are there any better ways to grow my business, such as building my own lead database? 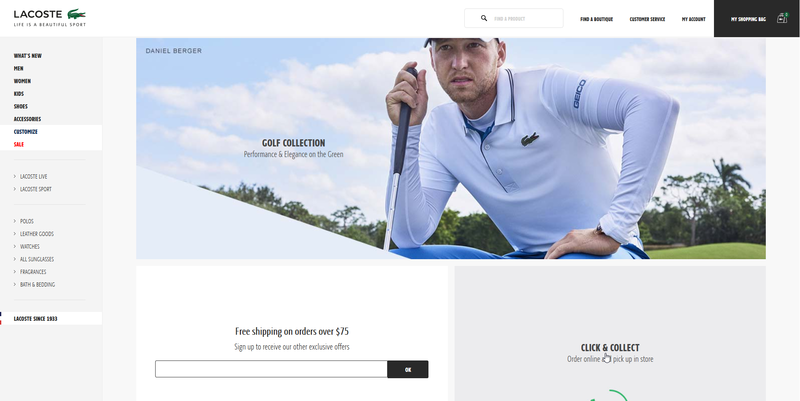 Collect leads on your own website, using call-to-actions (CTAs), banners and popups to convert more visitors into email subscribers. Physically collect emails offline at special events or turn collected business cards into contacts via a scanner app. Build your email list from public contact information found on websites. Good luck with your email lists, however you choose to obtain them! Emails are one of today’s best marketing tools – so you want to use them legally and in a respectable manner. We hope this article has helped you understand the confusing and sometimes conflicting regulations concerning the collection and use of email lists so you can own this tool and grow your business.